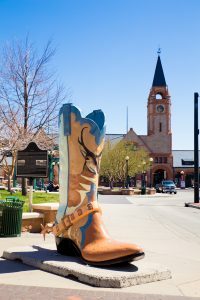 Grab your hat and boots for EMDR Professional Training’s Basic Training in Cheyenne, Wyoming! The city once quipped as the Magic City of the Plains, Cheyenne, Wyoming, is our home for three weekends, May 31- June 2, July 12-14 and August 9-11, at the Historic Plains Hotel. As a Hell on Wheels boomtown, Cheyenne basically popped up overnight as a result of the Union Pacific Railroad’s race to take trains from the Atlantic to the Pacific in 1867. This capitol city of Wyomin g still delivers with plenty of Western flair and frontier spirit that you’ll enjoy when you register for EMDR Professional Training’s Basic Training three-weekend course. At EMDR Professional Training’s Basic Training weekends, you learnfrom the best. Dr. Curtis Rouanzoin brings over 27 years of experience in EMDR Therapy and is internationally known as a premier trainer. Dr. Michelle Gottlieb is an international speaker of the topic of EMDR Therapy who is known for presenting the principles of EMDR in an accessible style. Both are college professors with extensive experience in presentation of both theory and practice. Simply put, you do not want to miss this opportunity to hear from these highly experienced professionals. EMDR Professional Training sets itself apart by offering you a three-weekend, all-inclusive training. In your three-weekend training you receive not only the best training available from the experts, you are also guaranteed to engage in smaller breakout groups of no more than eight people. EMDR Professional Training also includes consultation as part of the training, so no additional cost or time is required to complete your basic training. Everything you need for certification is included in these three weekends. What are you waiting for? Begin your registration today by going to EMDR Professional Training’s Registration — Cheyenne. P.S. Cheyenne’s famous Frontier Days are happening July 19-27. Plan now to stay for a concert or the rodeo! Click here for more info: Cheyenne Frontier Days 2019.